Good morning! The sun is shining, my house is relatively clean (miracle), I have two delightful children by my side (one is getting over the flu) and there are strong, talented construction men in the bathroom making much needed updates and repairs. All is well. God is so good to us, filling our lives, which can be so very very dreary, with many blessings and encouragements. I am so thankful to belong to Him, thank you Jesus for your care and guidance and love. TODAY, on “handmade”, day NUMBER THREE, I share with you a photo of a very little something I made for my dear mama recently. It is a small wall hanging made of scrappy pieces, and embellished with lots of sewing, some beads and buttons (NOT plastic, just because mom and I love heavy glass beads and old buttons)….snips of ribbon, and my very first humble attempts at crazy quilt embroidery. I actually forgot to take pictures of it before I gave it to her. This is a phone pic that I had sent to Joanna and Dawn asking for their opinions on it. Dawn suggested buttons and I did sew some on (after I took the photo). I placed vintage white ones down the flowery red ribbon. I sewed a metal ring to the top, just below the edge so it was hidden, for her to use in which to hang it. I’m anticipating making another! It was a perfect little project for my busy life, because it’s small, unfussy, there is no pattern…… it’s almost instant gratification. I LOVE them, they are so pretty and creative. I’m thankful for the inspiration on pinterest and the blogging world! In the spirit of such, how about (pretty please) sharing your favorite pinterest or blog links, featuring handmade crafty sorts of things, in the comments? This entry was posted in a simply lovely life, it's the little things and tagged crafts, handmade, sewing by Shanda. Bookmark the permalink. So beautiful Shanda! 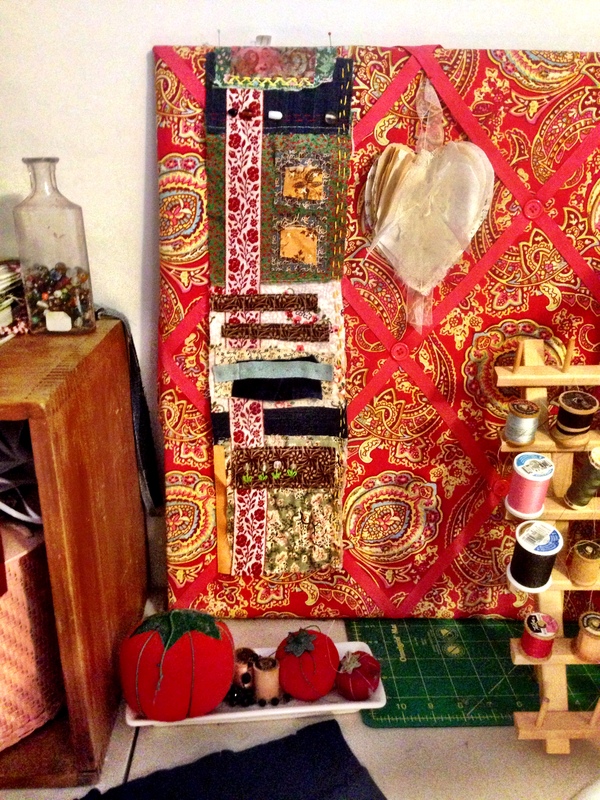 I adore handwork, and your textile collage is amazing! You’re a natural. Do you follow Alicia Paulson’s blog, Posie gets Cozy? If not, I think you’d really enjoy her blog and her little shop where she sells patterns. I agree pose gets cozy. Or rosies ramblings. Love the scrappy patterns together and the textures. How darling. I am sure your mom loved it. Bob and I say we are going to quilt in our old age…it is probably time to start learning 🙂 I haven’t done too much in the way of crafty things of late. I follow a facebook group “Artist’s Journal Workshop”. I like to see what others are drawing. I garden and read mostly with spare time,and check in online.